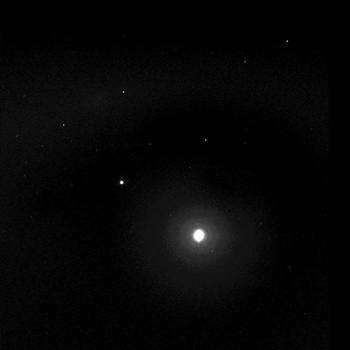 Taking advantage of extra solar energy collected during the day, NASA's Mars Exploration Rover Spirit settled in for an evening of stargazing, photographing the two moons of Mars as they crossed the night sky. "It is incredibly cool to be running an observatory on another planet," said planetary scientist Jim Bell of Cornell University, Ithaca, N.Y., lead scientist for the panoramic cameras on Spirit and Opportunity. This time-lapse composite, acquired the evening of Spirit's martian sol 585 (Aug. 26, 2005) from a perch atop "Husband Hill" in Gusev Crater, shows Phobos, the brighter moon, on the right, and Deimos, the dimmer moon, on the left. Tiny streaks mark the trails of background stars moving across the sky or the impact of cosmic rays lighting up random groups of pixels in the image. Scientists will use images of the two moons to better map their orbital positions, learn more about their composition, and monitor the presence of nighttime clouds or haze. Spirit took the five images that make up this composite using the panoramic camera's broadband filter, which was designed specifically for acquiring images under low-light conditions.